The U11 sports a gorgeous 5.5-inch display. The choice of this screen size means HTC has bumped up the default display size for its flagship. Screen size has been slowly creeping up since the first HTC One (M7)'s 4.7-inch. The M8 and M9 both had a 5-inch screen, and the HTC 10 was the first QHD screen on an HTC flagship, which also got a minor bump in size to 5.2 inches. The display itself is a Super LCD 5 IPS display with QHD (1440 x 2560 px) resolution and offers a pixel density of 534ppi. It offers great viewing angles, bright colors, dark blacks, and great contrasts. The U11 isn't the brightest screen around, nor was the HTC 10 last year, either. 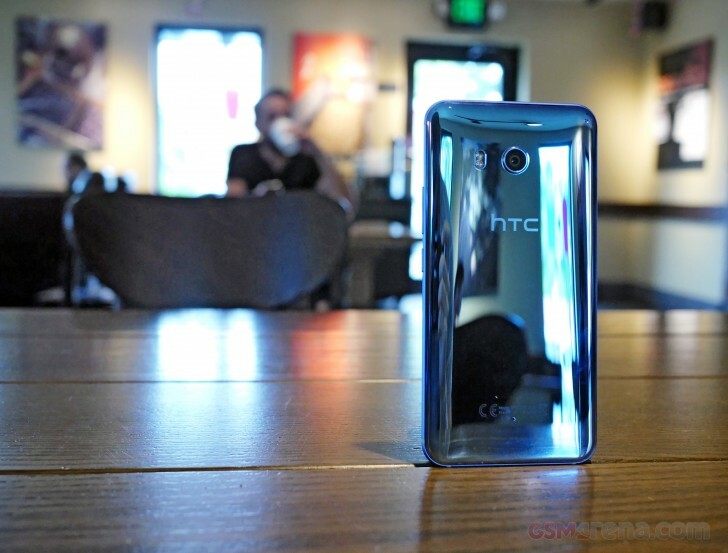 While Apple and Samsungs flagship phones easily break the 600-nits mark, the HTC U11 remains well under 500. Once bright light shines on it, it's able to go into an overdrive mode, which gets it another 100nits extra for a maximum brightness of up to 583nits. So is this display any better when it comes to color reproduction? Kind of. The HTC U11's default setting yielded an average deltaE of 4.9 with a max detlaE of 9.8 @ 50% grays. Our unit's display is tuned very cool, so whites and grays looks blue and colors almost appear oversaturated. Thankfully, there's a setting that allows further tuning of the display, though it only lets you nudge it warmer or cooler. After setting it three notches warmer, we were able to achieve numbers much closer to color-accurate. The average deltaE was 3.1 with a max detlaE of 5.1 @ green. The display gets quite dim at 6 nits, dim enough to pick up your phone in the middle of the night and use it comfortably. Otherwise, if you wear polarized sunglasses, you'll be able to see the screen just fine as long as you aren't using it in landscape, as is the case with the majority of smartphones. Where LG and Samsung have the U11 beat is on HDR video playback. This isn't something that the vast majority of consumers are going bananas over and the amount of HDR content is still quite limited so we shouldn't count that agaisnt it. The screen's performance outdoors is not as competitive. Thanks to the relatively reflective front glass, the other flagships will probably give you better screen legibility in direct sun. 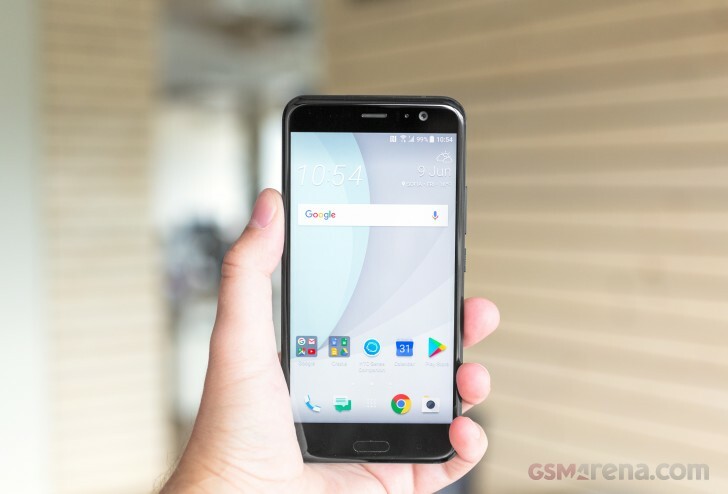 The HTC U11's Snapdragon 835 enables a vast variety of connectivity options thanks to the chipset's quad-band GSM modem. Single SIM and US variants will be capable of LTE-A Cat 16 with theoretical speeds of 1024/75 Mbps. Meanwhile, the DualSIM models will be Cat 15 with theoretical speeds of 800/75 Mbps. There will be a singleSIM and dualSIM version for Global distribution while the US gets two variants: one will be sold unlocked and will work on all US carriers including CDMA carriers Verizon, while Sprint will get its own model, which they will sell directly. All variants will support Wi-Fi 802.11 b/g/n for 2.4GHz and 802.11 a/n/ac for 5GHz (dual-band Wi-Fi). Wi-Fi Direct, Bluetooth 4.2, A-GPS, and GLONASS are also present. The USB-C port may be used for OTG and is capable of USB 3.1 speeds. There's also support for Qualcomm's Quick Charge 3.0. NFC is also here, of course. The USB-C port is also relied on for outputting external audio since there is no longer a 3.5mm headphone jack. HTC's included U Sonic headphones have a USB-C connector and the phone comes with an adapter as well. HTC Connect is baked into Sense UI and offers native support for Airplay (HTC 10 was the first Android phone to support Airplay out of the box), AllPlay, Blackfire, Bluetooth, Chromecast, and Miracast devices either nearby or on your Wi-Fi Network. You can also connect to DLNA devices through here. HTC connect is intended to "Choose where to play media". You can find HTC Connect in the Settings. The HTC U11 has the same sized battery as the HTC 10 - it's 3000mAh. It does need to power a larger 5.5-inch display, up from the HTC 10's 5.2 incher so we were a bit pessimistic starting our battery test. If you were one of the people who were disappointed by the lack of a battery capacity upgrade, you'll be glad to know that the U11's score is a bump above the HTC 10's initial battery performance from last year. The U11 didn't do a whole lot better, but the improvement is more remarkable when you remember that it has a larger screen. While the U11 scored 1:20h lower than its predecessor in 3G talk time, it did better in every other category. In both our web browsing and video test it scored about an hour and a half better than the HTC 10's 9:08h and 8:42h scores, respectively. Combined with the battery draw we measured in standby, all these numbers yielded the U11 an overall battery endurance score of 73h. Despite its improvement over the HTC 10, the Galaxy S8's endurance score of 84h is still unmatched, thanks to its AMOLED screen and superiorly efficient standby power draw. The HTC U11's battery scored 73h, and although its categorical scores weren't too bad, we figured the U11 could have done even better if it wasn't for the above average power draw in standby. The U11 features Quick Charge 3.0 just like the HTC 10 did. Under ideal charging conditions like proper ventilation, the U11 charged up to 52% in 30 minutes. Varying charging conditions like poor thermal ventilation or too high of an ambient temperature will result in slower charge times. The U11 battery life may not be among the best, it's certainly consistent and well above average. The battery should last all day for most, though if you're a heavy user constantly streaming and listening to music, you might want to carry a charger around with you. Our proprietary rating denotes the number of hours the phone will be operational if you are to make an hour of 3G talks, web browsing and video playback per day. Such usage pattern may not apply to you directly, but we've established it so our battery results are comparable across devices. The proprietary score also includes a standby battery draw test, which is not featured in our battery test scorecard but is calculated in the total endurance rating.